This is the full text of the script of the film Harvest of Despair, with 29 annotations (researched explanations of some of the terminology used). They are marked in red and linked to the explanations. SLAVKO NOWYTSKI - producer and director. He was born in Ukraine and his family settled in Canada in 1950. He received his professional education as an actor and director at the Pasadena Playhouse College of Theatre Arts and his Motion Picture Production education at Columbia University. After Harvest of Despair, he created a number of other documentaries on Ukrainian subjects: The Helm of Destiny manifests a sensitive study of Ukrainian immigration to the USA, while Reflections of the Past dealt with the first immigration to Canada. Since 1993, Mr. Nowytski has been working as an International Television Broadcaster for Voice of America in Washington, D.C., where he lives and produces the Ukrainian-language weekly magazine-format program popular in Ukraine, Window on America. YURIJ LUHOVY – was producer, editor and associate director of the film. He was born in 1949 in Belgium and lives in Montreal, Canada where he owns the film production company La Maison de Montage Luhovy Inc. He earned a BA in cinematography and French literature at Sir George Williams (Concordia) University and has devoted himself to professional filmmaking as producer, director and editor on many films, one of which was Freedom Had a Price – on the internment of Ukrainians in Canada during World War I - whose production was supported by the UCRDC. It is called the forgotten holocaust - a time when Stalin was dumping millions of tons of wheat on Western markets, while in Ukraine, men, women, and children were dying of starvation at the rate of 25,000 a day, 17 human beings a minute. Seven to ten million people perished in a famine caused not by war or natural disasters, but by ruthless decree. To commemorate the 50th anniversary of this tragedy the Ukrainian Famine Research Committee (former name of UCRDC) gathered materials, sought out eye-witnesses and documented this horrific event. Harvest of Despair is the product of this effort. The documentary probes the tragic consequences of Ukraine's struggle for greater cultural and political autonomy in the 1920s and 1930s. Through rare archival footage, the results of Stalin's lethal countermeasures unfold in harrowing detail. Harvest of Despair examines why this man-made famine remains so little known. Blinded by radical leftwing ideals, world statesmen, such as Edouard Herriot, Pulitzer Prize-winning journalists and writers such as George Bernard Shaw, all contributed to the regime's campaign of concealment. Even the democratic governments of the depression-hit West preferred to remain silent over Soviet Russia's atrocities in order to continue import and export trade. In 1932-33, roughly one-quarter of the entire population of Ukraine perished through brutal starvation. 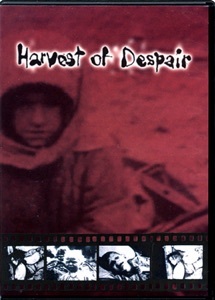 Harvest of Despair, through its stark, haunting images, provides the eloquent testimony of a lost generation that has been silenced too long.